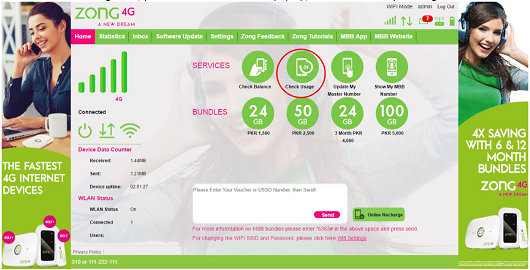 All Zong Mobile Broadband devices have a special Data only SIM card packed with the device. This SIM is called MBB number and is used in the MBB device you have purchased. You cannot use this SIM in any mobile phone since voice is blocked on this SIM and only internet and SMS/USSD is enabled on it. The MBB MSISDN is written on the MBB SIM jacket. Please keep this jacket with you since this number will be used for recharge/mini load and subscribing/change MBB internet bundles. 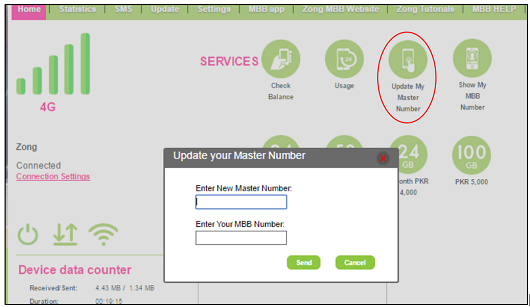 When you purchase any Zong MBB device, Zong representative will ask you for a MASTER NUMBER. This number can be any ZONG number you are using on your phone or any other mobile operator number in your use. If you give an OMO Master Number, you will receive product related information via SMS from time to time. 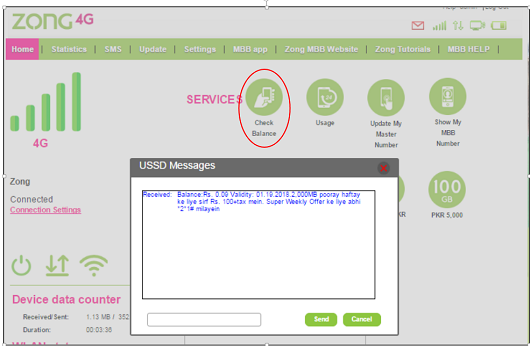 If you give a ZONG master number, you can perform below functions on behalf of your ZONG MBB number through this master number. Transfer balance from Zong master number to Zong MBB number. If your Master number is other mobile operator's number then you will NOT be able to receive usage notifications. You can visit any Zong Service Center, Franchise or retailer to recharge your MBB number. Just tell your MBB number and amount to be transferred to Zong representative. You can recharge using their debit/credit card online (https://www.zong.com.pk/o2o ). Please enter the MBB number on the portal and follow the guidance to recharge. Reply with 3 to recharge your MBB number through Scratch card from your Master Number. Customer can access Zong Mobile Broadband device portal by connecting device to laptop/PC/Power source, portal page will pop-up. In case of delay, type 192.168.8.1 in URL or Address bar to access portal. If you are unable to use all the above-mentioned methods, take out the MBB SIM from the device and insert it in any available handset. To load your scratch card dial *101* <15 digit code> # & press SEND. Your account will be recharged (Free of Cost). Insert the MBB SIM back in the Zong Mobile broadband device to use High speed Data services. How can I subscribe/change MBB bundles? 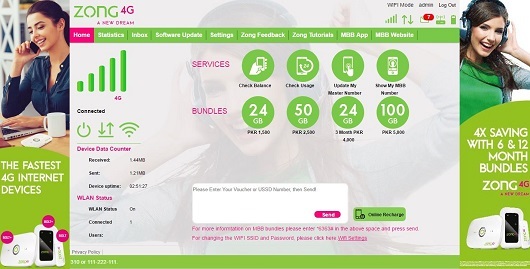 You can change your MBB bundle by visiting Zong CSC/ Franchise. Just tell the MBB number to Zong representative and the MBB bundle you want to subscribe, Zong representative will activate the bundle on your MBB number. Customers who have a Zong master number can subscribe MBB internet bundles on MBB number as per below process. Note: Please make sure you have enough balance in your MBB number for successful activation of the number. All the major MBB bundles are mentioned on the home screen, you can click on your desired bundle and it will be activated immediately. Please make sure you have the required balance before subscribing to any bundle. For bundles other than the ones mentioned in the portal please enter *6363# in the space at the bottom and press send, you will receive a list of all the bundles, please select the bundle of your choice by using this menu. Click Zong MBB Packages and follow the guidance and subscribe to your desired MBB bundle. Please make sure you have enough balance in your MBB number to subscribe the required bundle. If you are unable to use all the above mentioned methods, take out the MBB SIM from the device and insert it in any available handset. How can I Check the Internet Resources available on Zong MBB Device? Select Option "Usage of MBB #"
You will receive a message on your Master Number having details of your available resources on your MBB Number. 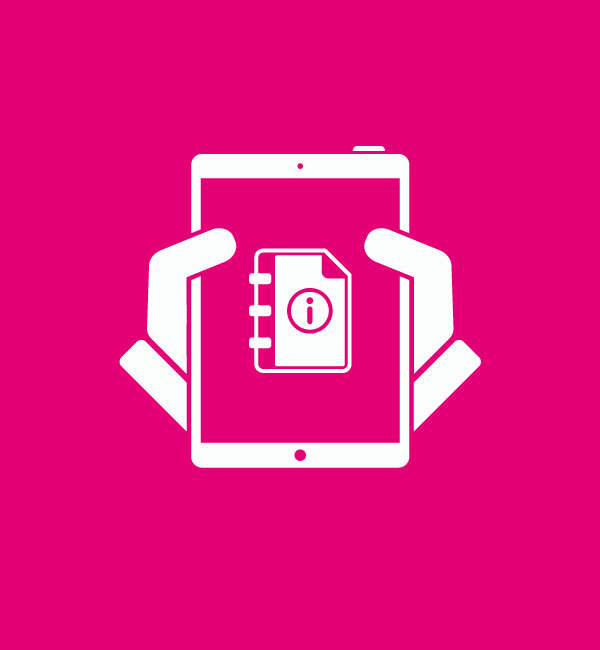 You will receive a message having details of your available resources. Insert the MBB SIM back in the Zong Mobile broad band device to use High speed Data services. How can I modify my Master Number? Master Number can be Zong number or any other mobile operator number. Select Option "Update Master Number"
How can I check my MBB Number? Select Option "Show MBB Number"
How can I check Balance of my MBB Number?